Stanley Stremmler has a big benevolent grin and gentle eyes that twinkle cloaking his moods and deep thoughts. He knows just what he wants and what it takes to get things done right. He is an enthusiast fisherman with a deep passion for catching salmon and finding oysters and shrimp. Stanley is of Dutch and German heritage and for over 30 years he capitalized on this old world practicability to be a very successful carpenter. 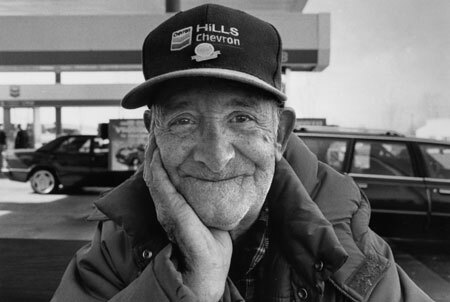 He's retired now but he loves helping out at Hill's Chevron,"just to keep myself busy." Although Stanley is deaf and mute he has no problem understanding or saying what he feels. He's extremely intuitive and articulates with his facial expressions and hand gestures, reminding us that words are only a small part of our daily communication with others. When we overcome our perceived handicaps as limitations, we simply observe them as attributes that help define us, rather than what separate us from each other.